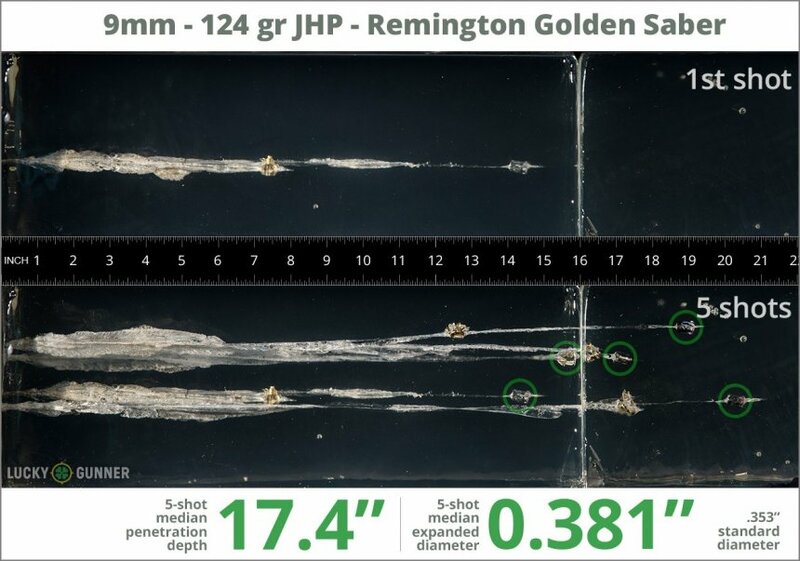 We wanted to know exactly what happens to a self-defense handgun bullet on impact, so following FBI protocols, we fired five rounds of Remington 124 gr Golden Saber from 10 feet, through four layers of cloth (to simulate clothing), into synthetic ballistic gelatin. The photos below show the bullets recovered from the gelatin after being fired from a Smith & Wesson M&P9C pistol. There’s also a high speed video that shows the bullet impacting the gelatin block. All the data we gathered pertaining to expansion and penetration of this load can be found in the chart below, and the diagrams at the bottom of the page show how it compares to other 9mm Luger (9x19) self-defense loads from our tests. In this case, most of the jackets separated from the bullets upon entering the gel. Because of that, we measured only the bullet. So, while the jackets may appear to have blossomed, the expansion is not credited toward the round in the chart and values as part of this experiment. 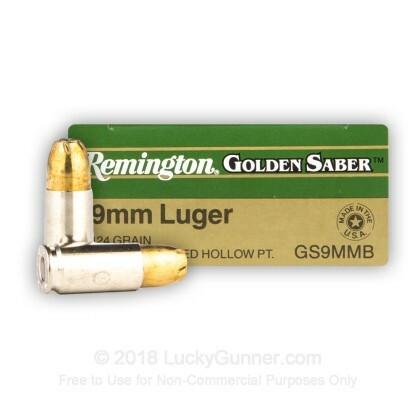 In addition to the 9mm Luger (9x19) Remington 124 gr Golden Saber, we tested over 100 other self-defense loads, so check out Lucky Gunner Labs for the full story. 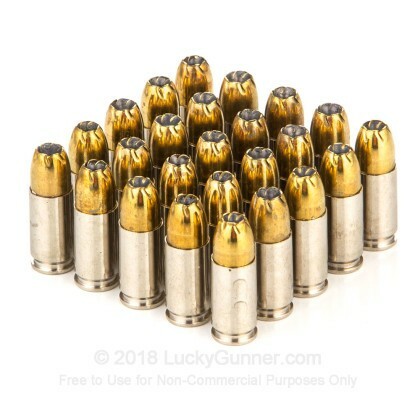 0.90" This ammo: 0.38" Min: 0.32" Median: 0.50" Max: 0.90"
17.4" 0" 5.6" 17.7" 47.5" This ammo: 17.4" Min: 5.6" Median: 17.7" Max: 47.5"
Prompt service at a great price. I am a dunbar armored guard and i use the golden saber for my kahr ct9. Real accurate round with tight grouping with no ftfs at the range. been using it a couple years and it always works well.on par with all the other premium rounds and better than most.only round i like better is fed hst. Returning customer, shipping is always fast and their prices are the lowest I've found. This is my CCW round of choice. Feeds fine in my S&W Shield. Functions perfectly in all my pistols. Consistent, clean, accurate. No malfunctions. Great price, great availability and fast shipping. Best price anywhere. Keep up the good work, LG! 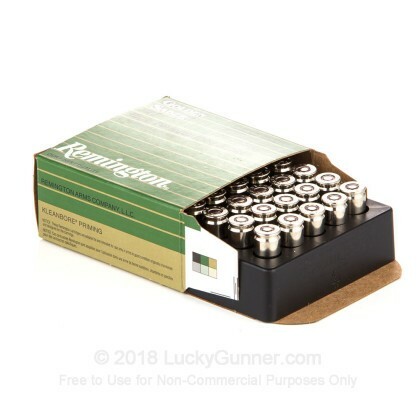 No one ships ammo faster than luckygunner.com!! These Remington Golden Saber JHPs feed like clockwork through my Glock 26 Gen 4 & my S&W Shield with no FTFs or FTEs......no hiccups at all. It's a little pricey so I don't use it on the range much. However, this is my primary choice for every day carry ammo for my 9mm handguns!!! I also use this brand of ammo in .45 cal for my Springfield XDs.....LOVE IT!!! Very pleased with both the performance and quality of my purchase. Smooth feeding and all that I expect from Reminton products , highly recommend !! I could not ask any more. They are GREAT!!! Golden Saber by Remington is simply my favorite brand, in several calibers. I don't see any need for +P, regular works just fine for expansion and reliability. This is some of the best ammo made for self defense. It hasn't misfired and cycled thru my S&W 9mm without any problems. I used 25 rounds of my recent purchase to stay proficient at the range with what I keep loaded at home and CC. Would recommend to others. Shipping was fast, the ammo looks good, will order again from Lucky Gunner. Have not not had time to go shoot it so performance rating is not actual. I am not dead because this ammo works. I had the unfortunate need to use my gun in self defense on night. 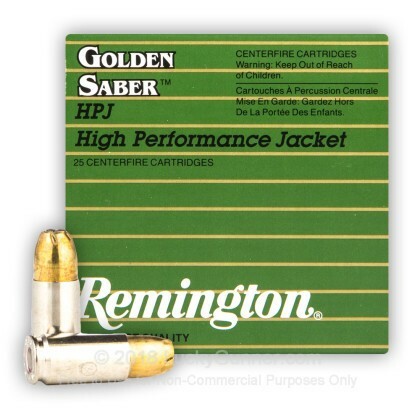 The Golden Saber rounds in 9mm had already been tested in, on and through various materials. 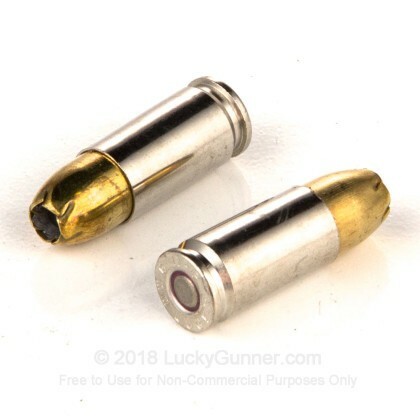 The 124 grain and 124+P were pretty much equal in short barrel guns for velocity. So if you have anything shorter than a 4" bbl the advantage of +P is minimal, and with a 3.6" bbl it was non existent. One night some person with a very long record of drug offenses, assaults, theft, burglary, and other crimes decided to try and run me down with his car. The muzzle flash of the Golden Saber at night makes it a great self defense round. It also opens up in ballistics gel more than other hollow points. Groupings are nice in tight, and I am still here to give a review. I have yet to have a misfire with this, but any ammo can misfire, cook off, or string off target due to a powder or primer issue. 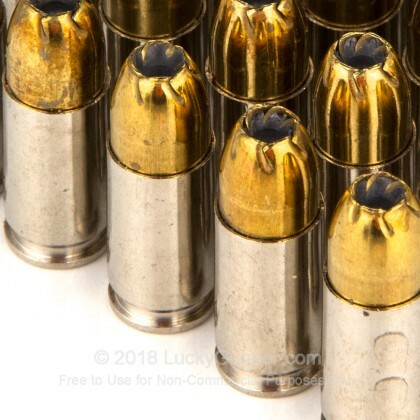 My 9mm Hi Power Browning would feed this ammo all day long. Aftermarket magazines did produce double feed jams, but some careful adjusting of the magazine with pliers solved that problem. Mec Gar or original Belgian magazines worked flawlessly. Now I carry Sig, Glock, or Beretta. I have been careful to only use factory magazines or Mec Gar for carrying the gun. The aftermarket mags are okay for the range, but they have let me down with jams too many times. This round is one of the best for flawless feeding an all the guns I have use it in. shot in my Glock 17, Kahr cm9, & W&W M&P 9c no problems. I carry everyday in the Kahr cm9! Used these in my PX4 storm full size no problems. Used a box at the range to test it but wouldn't use as RA as they're a little pricey. Fast shipping from L.G. Thank you!! Will continue to come back for more. I chose the golden sabers for my LC9. The rounds cycled flawlessly, and on target. Definitely gonna buy more of these. As usual, LuckyGunner shipped them ultra quick! Works great in my Solo. Golden saber JHP's for self defence? I say yes! Amazing quality, and performance. Fired over 100 rounds through my Glock 17 with no problems. You cant beat the price either!!!! Buy them asap!! In loading the ammo in my p226 I always chamber a round and decock my pistol for the first round.It is important for me to practice the way I carry and this allows me to see what the first trigger pull is all about.However with this ammo I had a ftf for the first round.I pulled the round and it appeared to be a hard primer.I put it in for a second try and fired no problem.Every shell after had no problem firing.I fired a 20 rnd mag total that day with 1ftf and 20clean .My problem with this ammo is If you're intent for this ammo is home defense is it going to be the first round, somewhere in the middle of the mag or at the very end that won't fire off? Works well in my Walther--over 100 rds and no jams. Have had problems with another brand.